Descartes’ hyperbolic doubt begins the age of modern philosophy by forgoing most of the previous metaphysical assumptions established in the scholastic schools of thought. In doubting all sensory perceptions and the body, he arrives at the fundamental assumption that only his thoughts “as is” exist and thus he exists through thoughts; one’s skepticism of his/her existence via thought is sufficient to prove the existence of the mind. Knowledge of external things is not known in the senses/body as the binding of senses to objecthood occurs in the thoughts/mind; senses are unreliable as they require constantancy to form a description of the world at this low-level. The ability of the mind to make deductions (rationalism) and to ignore the body suggests an immaterial quality that is exception to natural laws. The apparent dualism between mind & body and how the two can interact is a problem that later philosophers will have to address. Spinoza opposes the mind-body dualism by arguing that everything that exists in nature has a common substance (objecthood) and is synonymous with God (Pantheism). 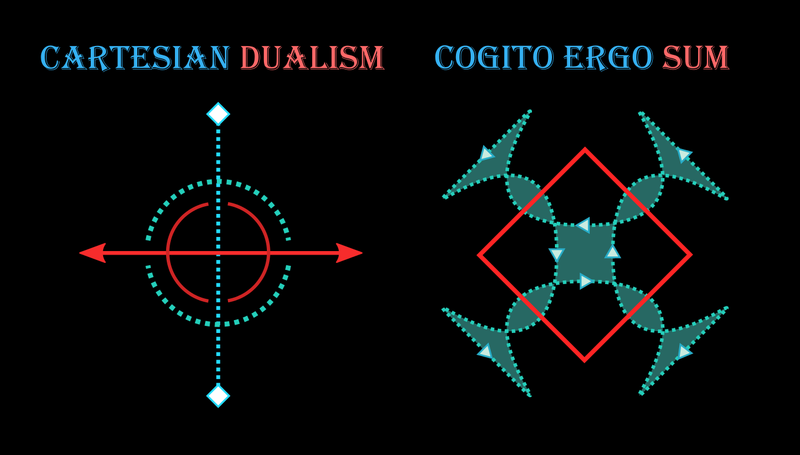 Both thoughts and extensions are attributes of this substance (among an infinitely many that we are not aware of) with different modes (modifications). His ethics are Epicurean and negates absolute good/evil as either can be positive/negative w.r.t. pain/pleasure. His writings on psychology expounds upon active & passive (passions) emotions where the former rises from understanding and latter by external causes; passions, which are purported to be responsible for the ills of the world, can be transformed into understanding so that we become the cause of our effects. These concepts will be the seeds for the later development of psychoanalysis in the 19-20th century. Leibniz’s solution to the mind-body problem was a new metaphysics based on elementary particles called Monads that reflects the universe (blurred perception of other Monads), are uninteracting (immaterial), and are in pre-harmony with each other. Monads are independent as they have been pre-programmed since inception; they are centers of force from which space, matter, force are appearances. For man, Monads are hierarchical and serve (pre-programmed) the purposes of single Monad that represents his soul. Thus, the non-interaction between Monads resolve the mind-body issue at a cost of free-will. The determinism in his metaphysics creates theological problems; one inquires as to why God allowed for the ills of the world to exist in contradiction to his absolute goodness. The explanation holds that the world is the best of all possible worlds with the largest surplus of good. This follows from the tenant that everything that which does not exist “struggles” to exist (be realized) in the world; the law of compossibility (fewest contradictions) asserts that the world consists of heterogeneous truths. One can view this as a utilitarian solution for maximizing good in an over-determined system. Locke’s theory of knowledge flipped that of Descartes on its head by placing experience above reason. Knowledge is empirical as it first comes by the senses and then the perception of the mind’s operation (reflection); the mind is initially a blank-slate (tabular rasa) without a priori ideas to which simple to complex ideas are built from experience in a bottom-up manner. Knowledge is thus the agreement of ideas between minds to which the problem of knowing ultimate causes outside experience is circumvented; the cause is often conflated with the sense of the cause. The investigation of ideas is thus probabilistic as they can only be confirmed by experience or by the testimony of experiences of others. A consequence of Locke’s empiricism enables him to take stances on ethics and state-crafting that are more closely aligned with political actualities. Working from Hobbes, Locke defines the “state of nature” as a lack of a common judge or authority amongst equals with natural rights (life, liberty, and property) grounded by natural laws (Christian ethics). Similar to Hobbes, man engages in a social contract to form a civil society as to protect his natural rights. Unlike Hobbes, authority is not unconditionally (with the exception of self-preservation) handed over to a monarch but instead is given consent which is contingent upon its ability to protect said rights; the denizens are responsible for revolution if the government is ineffectual at its task. The tension between private interests and the rights that were given up to form the public are palpable in the short term but through the assumption that man is rational, will coincide in the long term; prudence is thusly valued. Property, as a natural right, derives from the Christian conception of natural resources given to humanity in common by God. Man, who owns himself, owns his labor to which it enters natural resources and transforms it into property.